Men are social animals and most of our activities are governed by imitating others, whether you realize it or not. The non- verbal rules which we don’t need to spell out, we anyways follow them anyhow…why? WheeBuzz brings you 9 psychological facts about ourselves. Read on to know more. 1. We turn the volume down or off when we are driving in unfamiliar locations. This is perhaps the most common one, when we are driving in a relatively unfamiliar part of the city or trying to look out for a specific address we automatically turn down the volume of the music of our car, slow down our speed and even stop talking to our co-passengers so that we can concentrate and reach our location right on schedule. This phenomenon has been explained by stating the fact music reduces our visual intake of the brain and gets it distracted. So next time if you do not want to miss the next turn then put off the radio. 2. We gesticulate while talking. When we are deep into a stimulating conversation, we tend to start gesticulating with our hands to emphasize our point. Experts say it’s a primal body reaction when we want to make sure our idea reaches our audience clearly. Cornel university experts pointed out that natural network of the brain, since our evolution has been doing so to send social signals and even animals and birds do the same. So if you gesticulate a lot blame it on your evolutionary genetics. 3. We prefer to park our car near another car in an almost empty parking area. This is the classic textbook example of herd mentality. We subconsciously park our cars next to the other cars even if we have space in the entire parking lot empty. This speaks a lot about our need to belong. Scientists from Yale University explained this behavior with a new hypothesis. We are today bombarded by in numerous services and products and we are CONFUSED. So we tend to follow what the majority of our fellow brethren are using or choosing which gives us confidence and saves time and effort. 4. Men don’t use 2 neighboring urinals. Urinals are perhaps the most private spaces for complete strangers. This is an environment where privacy and personal space is very zealously guarded by all men. That does not rule out uncouth shameless people who would stand right next to you and guess what try to strike a conversation too while you are doing your business! But most of the men have sense and they would prefer to keep a distance from prying eyes, which is the most civilized thing to do in a public urinal. This unspoken law is called the diffusion of entitlement which is directly contrary to the universal fact that when the resources are scarce the scramble for outs demand increases. This logic has been successfully used by the supermarkets for decades now during sales. But experts from Stanford University have come out with a corollary in human behavior by stating that last piece of pizza, donut or pastry is left untouched by a group hoping someone else would take it and it would be the right thing to do. Bizarre but it happens all the time. 6. Men prefer not to ask directions. Yes, the wives and girlfriends were right about this one that their partners hate to ask for directions. It’s been proven by various surveys conducted and it can be directly linked to…you guessed it right, the inflated male ego. So much so that men end foolishly driving 900 extra miles just because they accept they are lost. Asking for direction directly hurts their men’s self-confidence, sense of competency and they feel insulted deep within. So when your husband does not want to ask for the direction he is vulnerable, just do the favor for his behalf, please. 7. We hold doors open for other people. Holding doors open for others in schools, colleges, and the office was always inculcated as a pinnacle of grooming and polite upbringing. Scientists also have another reason why we do it and that is to save the collective effort spent by the person standing behind you. Is it altruistic? Yes by doing this we are saving the effort and energy of others. 8. We neither buy the most expensive nor the cheapest things. Unless your bank balance is similar to Paris Hilton’s, where money is not an issue, the rest of the middle class are very smart with their money. So we all have the tendency to always take the middle road when it comes to spending. We may be attracted towards the high-end products or tempted towards the cheap sales and absolute steal deals but eventually, we end up buying stuff from the middle range. There is a reason behind this behavior, we do not want to compromise between the qualities of the product as well not burn a hole in the pocket by buying the product which product might be overpriced. 9. We place our feet toward a person we are interested in. Our body language says many things which we need not verbally communicate and sometimes they are more powerful than words. It can be blamed to our evolutionary process again. If we keep our arms or legs crossed reflects our discomfort. It’s a sort of survival instinct which is as primal and as old as we are. 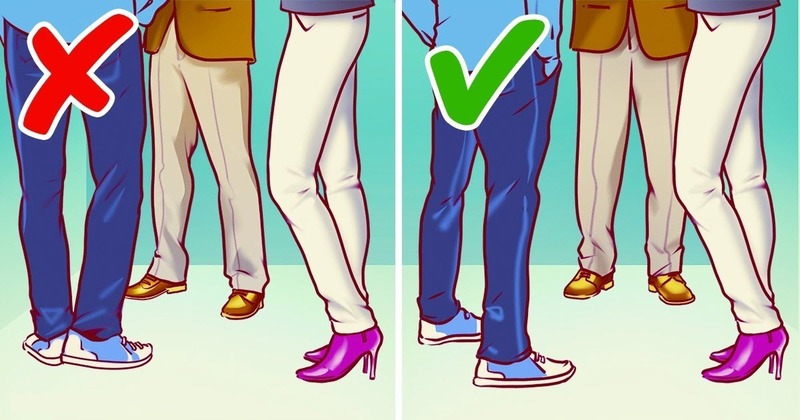 So next time when you are on a date and he/she looks at you with facing his/her torso towards you but not their legs, take the hint and make it short as your date is bored and not that interested in you. Previous article 5 Serial Killers With Horrifying Stories, Read at Your Own Risk! !